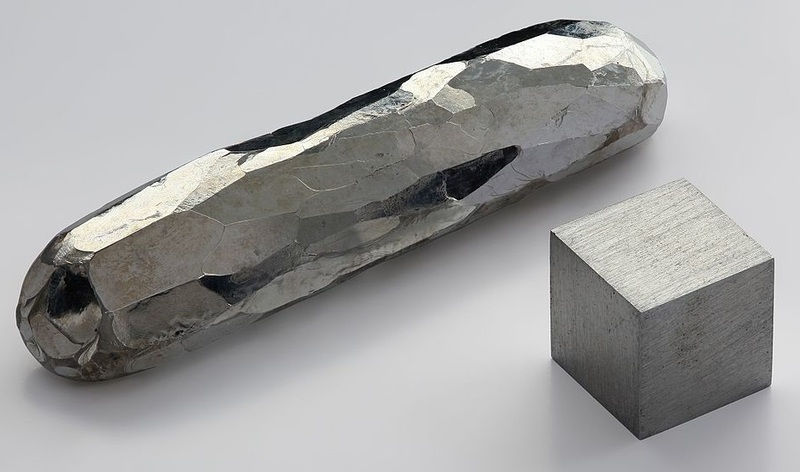 Cadmium is a soft, lustrous, bluish-silvery-white metal which can be easily cut with a knife. It is tarnishes in air, and soluble in acids but not in alkalis. It is similar in many respects to zinc. 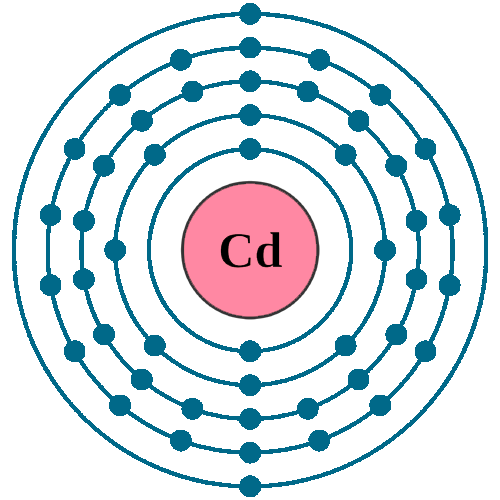 Cadmium doesn’t react with air, under normal pressure and temperature. At 300 oC Cd forms a thin brown gas-permeable coating. The metal burns(above the sublimation temperature of CdO, 1380 OC) in air to form Cadmium (II) oxide. Cd reacts very slowly with distilled water. Cd (s) reacts with I2 (aqueous), But not react I2 (gas). Cd (g) reacts with I2 and forming Cdl2. Naming: Greek: kadmeia (ancient name for calamine (ZnCO3)); Latin: cadmia. It is Poison and cause birth defects and cancer, So it has limited use. About 80% of cadmium is used in rechargeable Nickel-Cadmium (Ni-Cd) batteries, But now a days it is replaced with Nickel metal hydride batteries. 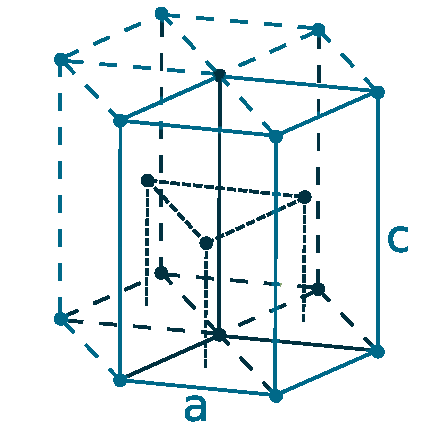 A Cadmium is extensively (about 60%) used in electroplate steel (film of cadmium only 0.05 mm thick can provide complete protection against the corrosion). It is still used today to protect critical components of Aeroplanes and oil platforms. 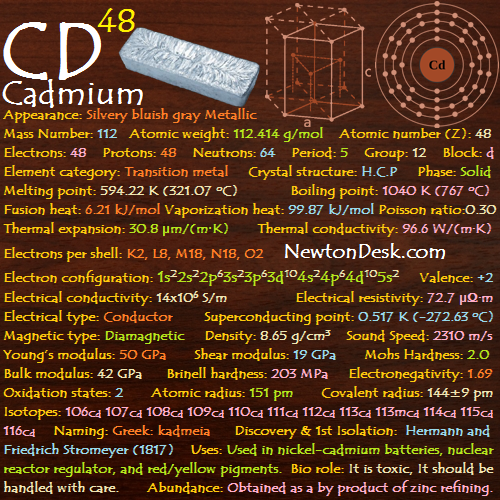 A Cadmium has the ability to absorb neutrons, so it is used in rods in nuclear reactors to control atomic fission. Cadmium compounds were used in black and white phosphors for B&W TV tubes and in blue and green phosphors for color TV tubes. Other uses of cadmium are mainly for coatings and plating, pigments (yellow, orange and red), and as stabilizers for plastics. Cadmium is toxic, carcinogenic and teratogenic (disturbs the development of an embryo or foetus), So It should be handled with care. On average we take in as little as 0.05 milligrams per day and It store in the body on average about about 50 milligrams. 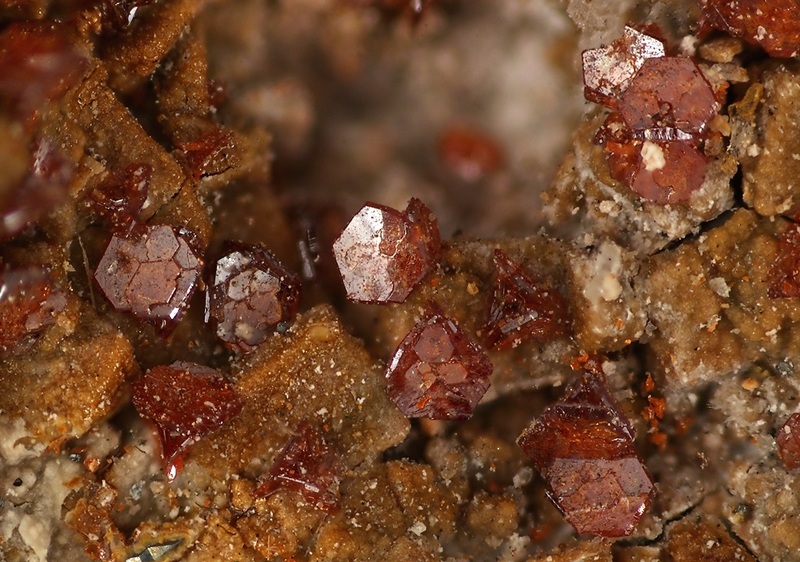 Cadmium mostly occurs in small quantities associated with zinc ores, such as sphalerite (ZnS). 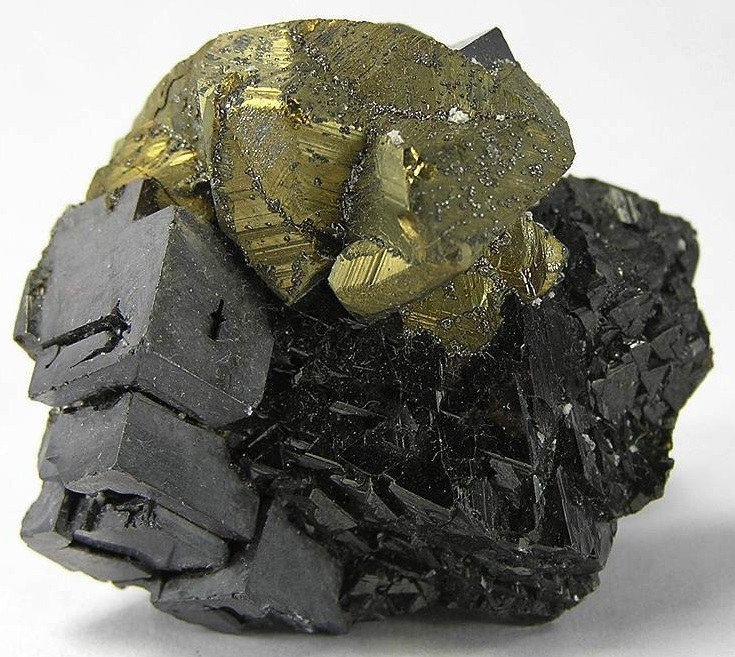 Greenockite (Cadmium sulfide, CdS) contains significant quantities of cadmium. Almost all cadmium is obtained as a by-product in the treatment of zinc, copper, and lead ores. Annual world wide production is around 13000 tons.